A real thrill seekers paradise but can also be run as a much more leisurely event. 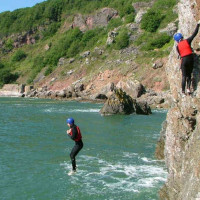 Explore the stunning coastline by climbing, scrambling, jumping, swimming and traversing. This activity is a real thrill seekers paradise but can also be run as a much more leisurely event. Coasteering is one of today's most popular and exciting adventure sports and forms a part of many of our adventure packages. For us mere mortals, explore the stunning coastline by climbing, scrambling, jumping, swimming and traversing. For the adventurous, the sky is the limit - jump from crazy heights into the sea for a feeling you have never experienced. Using only very experienced and trusted instructors and guides, everything you do will be done with your safety in mind. An adrenaline fueled experience that can easily be tailored to suit the age and ability of your group.